There's a time for fashion and there's a time for art. 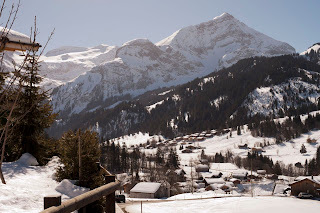 We are at Barbara's studio in Gstaad this week. My grandmother once said that the artist/painter is always alone. To put it another way. The artist needs soundless solitude in order to paint with feeling from his own soul. We leave you with this very pretty picture, which was taken this morning from our window in Gstaad ( click on the image to enlarge ). Long for spring, but snow in march can be wonderful thing - in switzerland! How lovely ~ enjoy, darling! What a gorgeous image! Enjoy yourself immersed in art in Switzerland.